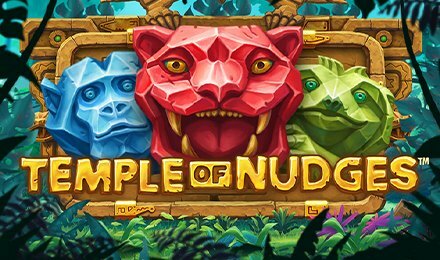 Join the quest to find the legendary temple of luck deep in the dense and humid jungles to the south of the continent in Temple of Nudges Slot at Vegas Spins. Legend has it that those brave enough to make the long and arduous trek to the ends of the temple will be rewarded by one of the animal guardian figures that ward the temple from intruders. This mythical game from Netent comes with 5 reels and 243 paylines. The game has a straightforward gameplay that will keep yourself immersed while you spin the reels for some potential wins. On the reels, you will find the different guardian animals carved in stone, together with strange tribal symbols. The background takes place in a lush and verdant forest with an ancient temple in ruins! Before starting Temple of Nudges Slots, you will need to register an account at Vegas Spins. If you already have an account, then just log in to play the game. Next, head over to the MAX BET section where you can adjust the stakes and coin values with the + and – Icons. Near the SPIN button, you will find the AUTOPLAY feature. You can choose the number of spins you would like to use with this feature. When you are ready, click SPIN to start. Bet Levels: Temple of Nudges Slot has 1 to 10 bet levels. Amount of Paylines Selection: You will find 243 paylines in Temple of Nudges Slot. Coin Values: The minimum value is £0.25, and the maximum value is £250.00 respectively. A winning combination will start this feature by moving a symbol one place down the reels. Therefore, giving you more chances to land more winning combinations. This will continue until no wins are left. You can unlock this round when you land a winning combination and the re-spin overlay appears on a symbol. The symbols that match the winning symbol will stay on the reels while the symbols that do not match will re-spin.